Wellness cat food comes in both dry and canned formula, they also have cat treats and pouches. 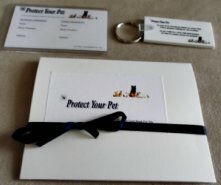 Their products cater to cats at all three stages of their lives, kittens, adults and seniors. Wellness states that their products are all high in protein, contains antioxidant support for your cat's cellular health, and has omega 3 and 6. Their food is considered to be a high quality premuim cat food. 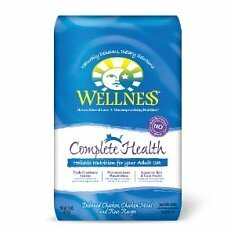 Wellness has two different formulas for cats, they have the Complete Health Dietary Solution and Core Grain Free. According to wellness cat food the complete health formula focuses on your cat's urinary tract health, cellular health and gives your cat a beautiful coat and healthy skin. Complete health has both dry and wet cat food. The dry food comes in deboned chicken, chicken meal with rice and salmon, and salmon meal with turkey. To meet your cat's special needs they also have a dry food for weight loss, indoor cats and for kittens. Complete Health wet food comes in several different flavors.They have beef and chicken, beef and salmon, chicken and herring, chicken, chicken and lobster, salmon and trout, sardine and crab with shrimp, turkey, snd turkey and salmon. According to the ingredients on each can, they contain real meat, some vegetables, and a bit of fruit. Wellness states that the fruits and vegetables add extra vitamins and minerals and help to maintain your cat's urinary tract health. Wellness Complete Health cat food ingredients always starts off with a real meat, which is always number one in our books. Although the complete diet does have vegetables and fruits in their formula, it's a limited amount of healthy carbohydrate, which cats in the wild would get from their preys. Our cats love the variety of the wet food, although they weren't crazy about the chicken and lobster, which we thought they would be, they loved the other flavors. Wellness cat food cans has a good amount of gravy, which our cats love to lick and keeps the food nice and moist. We also like the dry food, we bought both the deboned chicken recipe and the salmon recipe, our cats really seemed to enjoy eating them. Hopefully they will create more hard food recipes , variety is the spice of life, and we like to offer our cats different flavors. We like the fact that they have dry food for kittens, cats that need to shed those extra pounds and indoor cats, but they also need a formula for senior cats, since they do have different dietary needs. Also the kitten wet food only comes in one flavor, if your feeding your kitten a wet food diet only having one flavor is extremely boring. However, other than a couple complaints, we thought that Wellness food offered our cats a complete balanced diet, with all the vitamins and minerals they need, plus our cats liked the taste which is extremely important. Wellness cat food Core formula is a protein rich, low carbohydrate, grain free diet. It also has both dry and wet food, but is very limited in flavor options compared to the Complete Health. The dry food is avaible for kittens and adults and comes in one flavor, fish and fowl. Dry Wellness cat food contains protein from five meat sources, salmon and flax seed oil for healthy skin and coat, and micro-organisms to aid in a healthy digestive tract. The wet food also comes in limited flavors, only two, they are chicken and turkey with chicken livers and salmon and whitefish with herring. The core canned food is higher in protein than the complete, and also has fish and flax oils and doesn't contain any meat by-products, or artificial flavors. We would like to start off by saying that the concept of Core, a low carbohydrate, grain free, high protein diet is essential what cats should be eating. 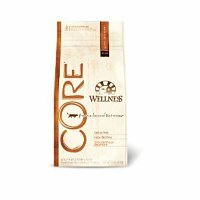 Core is especially recommended if your cat has food allergies, Core is made up of very basis ingredients and therefore can be a good choice for cats that are allergic to certain types of food. However the problem is first the very limited selection, both in the hard and wet food. Wellness needs to add some more flavor options to their Core forumula. Second our cats were not fans of the flavor, they tasted it and then walked away, this happened three times with the wet food, and they ate a small amount of the dry food.Even after pouring the gravy all over the wet food, and they love gravy, they still took a small bite and walked away, so I opened up one of the Complete Health can food and they ate it all up. 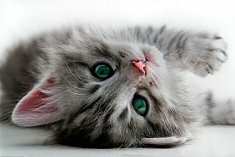 As we all know every cat is different, so your cat may love the Core formula, but our cats definetely prefered the Complete Health recipe and actually loved it. We do love the high protein level of the Core, and the fact that it has no meat by-products and no artificial flavors definetely makes it a high premium cat food that is good for your cat, but essential your cat's tastebuds decides if you will continue to buy a particular cat food. Wellness snacks are one hundred percent natural and grainfree, they come in two different flavors chicken and lamb and turkey and salmon. 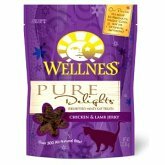 Our cats love these treats and we love to give them wellness treats. One hundred percent natural, no articficial flavors and grain free are all beautiful words that catch our attention when looking for a cat treat for our cats. These treats are soft and low in calories. Along with purebites and greenies, these are one of our cats favorite snacks. 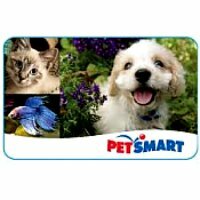 They cost about $3.99 on sale and $4.99 regularly at your local pet store or online. Wellness also has pouches which sell for about $1.29 each and comes in a variety of flavors. Range from $1.29 to $1.49 per can, prices may be lower or higher in your area. Starting from $9.49 for a 2 lb bag to $37.99 for a 12 lb bag. Out of a possible five pawprint we give Wellness cat food four. This is a great product that we love. Although they do need to add more variety to their Core products, we love the fact that Wellness cat food is meat by-products free, contains real meat and filled with vitamins and minerals. Blue Buffalo Cat Food -A detailed review of both the dry and canned food of Blue Buffalo.